To help you find the best photo booth for your party, event, or wedding, we’ve created a gallery of images to show you what all photo booths look like in Toronto, Ontario that are available to rent. Click on any image below to visit the photo booth company’s website and find out more about their booth. When renting a photo booth, there are a number of important things to think about that many people never consider. These issues include ensuring that the photo booth suits your venue, making sure you have suitable props, ensuring you have enough photo booth capacity, checking before your event to ensure picture quality, and making sure enough photos are printed for everyone. The number of photo booth rental companies that don’t show pictures of what their booths look like on their website is surprising (that’s a key reason why we created this page – to allow people to see what’s available in Toronto). 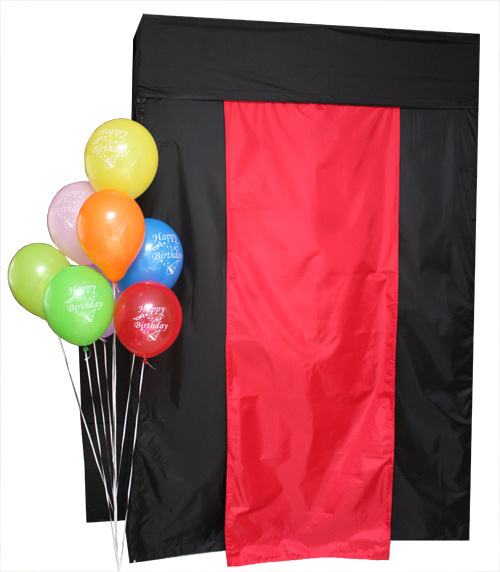 Some booths would fit in well at a party or informal event but not at a really formal wedding or corporate event. That’s one important reason why you should see a photo booth before you decide to rent it. Some companies also rent very classy looking enclosed booths which give guests some privacy and allow their creative or fun side to emerge. When you combine an enclosed photo booth with interesting or silly props, you really create a recipe for fun. If you’re looking for something really different and unique, some companies now rent slow motion booths, video booths, and flip book booths. With a slow motion booth, guests are encouraged to use props and other effects to stage a fun or exciting looking scene which is captured as 30 seconds of slow motion video.